DUNDEE, Fla. — Scientists predict there will not be any major breakthroughs when it comes to citrus greening, but a Dundee grower isn’t waiting around for answers. Instead he has created his own. Tommy Thayer, with Southern Citrus Nurseries, has been battling citrus greening for years, along with the rest of the world. With production at an all-time low, Thayer and his co-inventor, Scott Thompson, knew something had to be done. If not to save the industry, to at least save themselves. Now, three years underway, the two can say the product works. 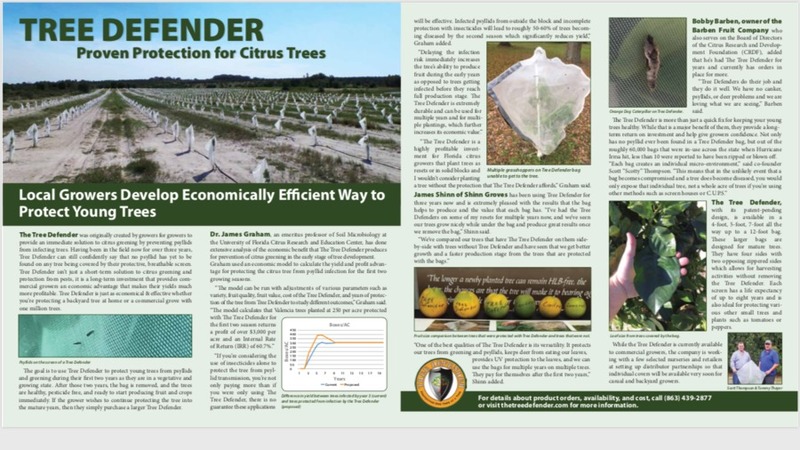 Tree Defender, is a net-like device that protects young orange trees from insects, specifically the Psyllid. The Psyllid is the insect to blame for carrying the greening disease from tree to tree. Once a tree is infected with the disease, it practically suffocates the plant and prohibits production. “We were desperate five years ago and now it’s worse than desperate,” grower and researcher, Ed Dickinson, said. He has also been looking for an answer when it comes to greening. He found his temporary solution when he met Tommy Thayer at an Expo, and decided to try Tree Defender, saying it’s the best solution for now. Right now citrus growers, just in Florida, are looking at a loss of billions of dollars, only producing 50% of their typical output in a year's time. And with Hurricane Irma ravaging the area just months ago, times are getting tougher. “You can see this is almost head high with me, where the controlled tree is still right here,” Scott Thompson said, demonstrating the impacts of the Tree Defender to ABC Action News. In just one year, a juvenile tree was saved from greening, was a deeper green and much taller compared to a tree that had been unprotected and out in the elements. The leaves from the protected tree were larger, greener and even from a layman’s eye - healthier. “You can see the characteristics of larger leaves are still vibrant growth still carrying on,” Thompson added. Each bag, right now will cost a grower $6.25 per Tree Defender. But, when adding up the costs of fertilizer, insecticide and other defense systems that have a much lower success rate, using the Tree Defender, will actually save growers in the short term and make them more money long-term. “By year nine, when you take this bag off you should have most of your production come in the third, fourth, fifth, and sixth and seventh years,” Thayer said. Even if the product doesn’t take off, local farmers say it’s working for them and their crops will be saved from further damage by citrus greening. “I think this is part of the answer, I don’t think it’s the silver bullet,” Thayer said.